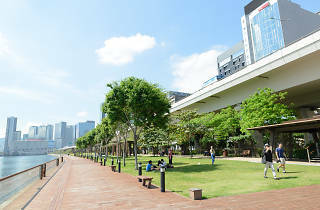 Waterfront broad walk in Kwun Tong with spectacular view of Victoria Harbour and Lei Yue Mun. 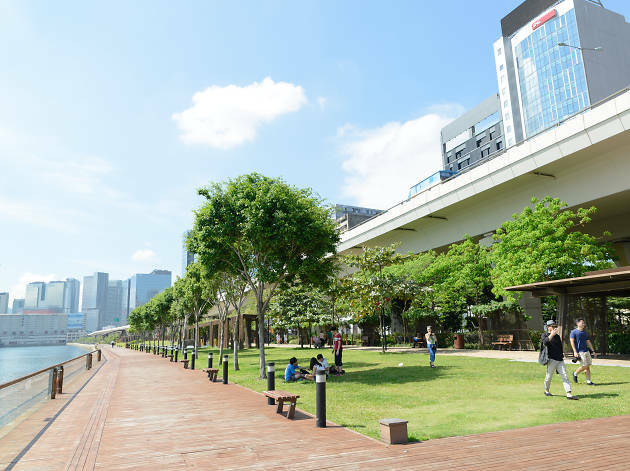 Revamped from a public cargo working area where waste paper recycling used to run their businesses, this waterfront broadwalk is a small oasis away from the busy district of Kwun Tong. Though it's only about one km long, the promenade offers specatular nighttime views of Hong Kong Island East and the panoramas of Victoria Harbour and Lei Yue Mun. Unique art installations in the form of mechanical cranes and waste paper bundles can be found along the corridor as a tribute to the former landscape. And with the help of dazzling light and mist effects, the installation really lights up the promenade.